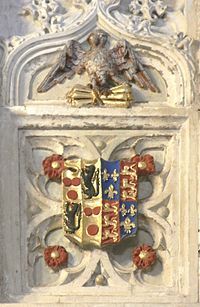 William Courtenay was born in 1475 to Edward Courtenay, 1st Earl of Devon and his wife, Elizabeth. His father had fought alongside Henry Tudor at the Battle of Bosworth and as such the family was well regarded by the new Tudor monarch. William, like his father was a key supporter of King Henry VII and he was made a Knight Bachelor on 25th November 1487. A Knight Bachelor is the lowest rank of a man who has been knighted that in modern day is awarded for public service. William was awarded this title at the coronation of Elizabeth of York. In 1495 William married Catherine of York, the sixth daughter of King Edward IV and sister to Queen Elizabeth. The couple went on to have children a son, Henry and it is argued as to whether they had one or two daughters both called Margaret. It is rumoured that the youngest Margaret died at a young age from choking on a fish bone. William like his father fought on the battlefields to help secure Henry VII’s throne and was a Captain in the royal army. He took to the field with his father in 1497 at the Battle of Blackheath to defeat Perkin Warbeck and his army as he attempted to stake his claim to the throne by claiming to be Richard, Duke of York, the second son of King Edward IV. The defeat of Warbeck at the hands of the Tudor army signalled the end to fighting in the Wars of the Roses. After the death of his wife King Henry changed and he began to suspect his closest allies of many things. William Courtenay did not escape the king’s suspicious mind and in 1503 he found himself arrested on the accusation that he had been corresponding with Edmund De la Pole, Earl of Suffolk and one of the last survivors of the Yorkist factions. It appears that the basis for Henry’s suspicion is down to the fact that William and Edmund were related through William’s wife. Attainder quickly followed and William remained in the Tower of London until King Henry VII died and his son took the throne in 1509. Henry had begun the process restore William as Earl of Devon, however it is unknown whether it was completed before William died on 9th June 1511 from pleurisy, William’s body lay in the King’s Court at Greenwich for three days before the King announced that his burial should be of a nobleman. As a result William was buried in Blackfriars, London.